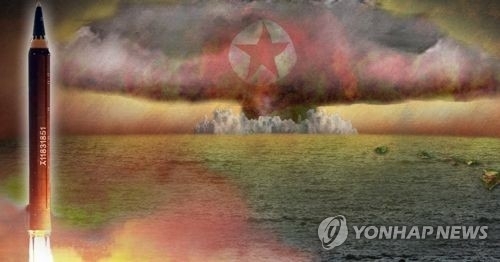 SEOUL, Oct. 5 (Yonhap) -- A hypothetical North Korean nuclear attack on Seoul and Tokyo could claim more than 2 million lives, a U.S. website monitoring Pyongyang said Thursday. The website, 38 North, released the report at a time of heightened tensions on the Korean Peninsula, following North Korea's nuclear and missile tests and the U.S. threat of using its military force. U.S. President Donald Trump and North Korean leader Kim Jong-un have also traded bellicose rhetoric, stoking fears of an armed clash on the divided peninsula. Author Michael J. Zagurek Jr. said based on calculations, nuclear detonations over Seoul and Tokyo with the North's current estimated weapon yields could kill as many as 2.1 million people and injure 7.7 million others. These figures were reached under the assumption that North Korea would launch its entire arsenal of 25 operational nuclear weapons against Seoul and Tokyo. The warhead yield, in this calculation, ranged from 15 to 250 kilotons. The estimated population of Seoul was 24.1 million, and that for Tokyo was 37.9 million. Zagurek Jr. used three levels of probability of detonation in calculating casualties: 20 percent, 50 percent and 80 percent. He took into account South Korea deploying the Terminal High Altitude Air Defense (THAAD) system to help protect against North Korean missile attacks and Japan being in the process of acquiring the Aegis Ashore ABM system.